Dudley, a lovable little Sof-Chamois beanbag Coker with its own story hang tag. 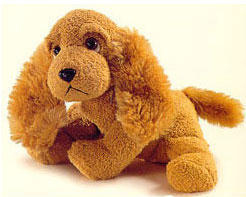 Size (inches): 5.91" X 2.36" X 4.72"
Luv Pets are non-allergenic, non-flammable and surface washable. I live in the UK and my daughter was given one of these and loved it. So had to order another 3 as backups.